January 11: Amber Tamblyn won the People's Choice Award for "Joan of Arcadia"
January 13: "Buffalo Soldiers" was released on DVD. February 6: Dean Stockwell appeared in the episode "People v. SECNAV" on JAG. Achievement Award at the Method Fest Independent Film Festival. 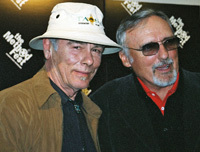 Dean Stockwell (left) presented Dennis Hopper the 2004 Method Fest Lifetime Achievement Award at the Sneak Preview Party. 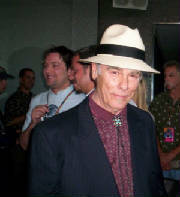 April 30: Dean Stockwell appeared in the episode "Fighting Words" on JAG. June 8: Quantum Leap was released on DVD. June 11 - 19: Dean Stockwell received a "Changed My Life" Award during the CineVegas Film Festival in Las Vegas. See the Las Vegas Weekly feature. June 26 and 27: Dean Stockwell appeared at The Hollywood Collectors & Celebrities Show in North Hollywood, California. July 20: The TV series Combat! was released on two DVD sets (Dean Stockwell's guest appearance is on the second set). July 30: "The Manchurian Candidate" premiered at movie theaters in the United States. September 3: Dean Stockwell hosted a reception for his first solo art exhibit at the RB Ravens Gallery in Taos, New Mexico. His artwork was on display there until October 31, 2004. October 15: Dean Stockwell appeared in the episode "Retrial" on JAG. October 29: Dean Stockwell appeared in the episode "Whole New Ballgame" on JAG. October 29-31: Dean Stockwell appeared at the Chiller Theatre Toy, Model and Film Expo on October 29-31, 2004 at the Sheraton Meadowlands Hotel, E. Rutherford, New Jersey. December 11: Dean Stockwell was a celebrity guest artist for the 16th Annual Child-Rite Art Auction, held in Taos, N.M.
Child-Rite is a special agency for children, based in Taos. The Honorary Auction Chairperson was First Lady of New Mexico, Barbara Richardson. Here's the Taos News article about the auction. December 21: "The Manchurian Candidate" was released on DVD. December 21: Dean Stockwell showed up as an invited guest artist at the "Winter Solstice Miniature Fun Show" at the Michael McCormick Gallery. He is mentioned in their News and Events page as the "Especial 'Mystery' guest, who is really actor artist Robert Dean Stockwell.